Stachys officinalis is a perennial grassland herb of the Lamiaceae family. Wood betony, as it is commonly called, grows to 1 to 2 feet in height (30 to 60 cm). Wood betony's somewhat wrinkly leaves are stalked on upright stems. They are narrowly oval, with a heart-shaped base, and have toothed margins. The calyx is 5–7 mm long, with 5 teeth, and is edged with bristles. The corolla is 1–1.5 cm in length. Its upper is lip flat, and appears almost straight when seen from the side. The anthers stick straight out. The plant flowers in mid summer from July to September. 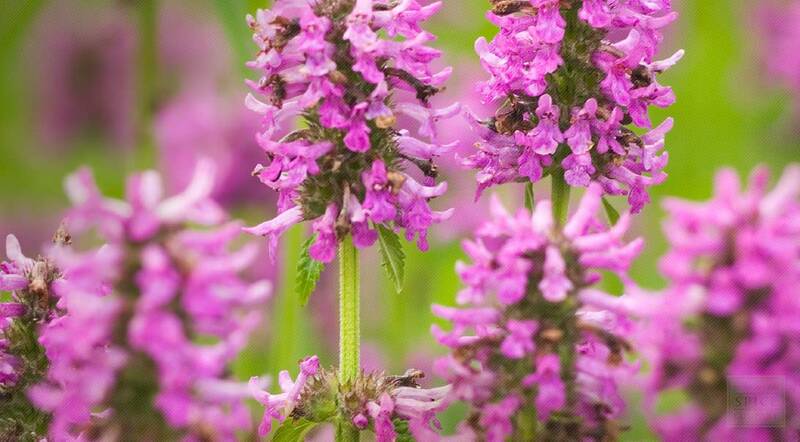 The common name betony is believed to derive from the ancient Celtic words bew meaning "head" and ton meaning "good". The word stachys comes from the Greek, and means "an ear of grain," it refers to the fact that the inflorescence is often a spike. Wood betony grows in dry grassland, meadows and open woods in sun to part shade. The wood betony plant prefers a light moist neutral to acid soil, it is a characteristic plant of heavy soils. Sow seed in spring in a cold frame. Transplant out the seedlings into individual pots once they are large enough to handle and plant them out in the garden in the summer. Can also divide plants in spring or almost any time of the year. Larger divisions can be planted out direct into their permanent garden locations. The whole plant is collected when in flower in the summer and can be dried for later use. Store dried wood betony herb in an airtight container in a cool, dry place. Stachys officinalis is native to both Europe and Asia. It grows in most of Europe, western Asia and North Africa. In the British Isles it is common in England and Wales, but is rarely found in Ireland or northern Scotland.